Hart image, May 7 or 9? I am trying to accurately date A. A. Hart's photographs at Promontory, May 1869. One of his images he dates May 9 as the first greeting of the iron horse. I believe the date should be May 7, 1869. Below is the image and my discussion. Comments welcome. H-23: Central Pacific locomotive from tender. Location: Promontory. Photographer: A.A. Hart, May 9, 1869. Union Pacific work train upper right. Alfred A. Hart produced a series of stereo card images of the Central Pacific Railroad, especially of scenes at Promontory Summit before and during the driving of the last spike. One of his stereo cards, Number 354, is labeled "The First Greeting of the Iron Horse, Promontory Point, May 9th, 1869." Hart stood on the tender of a Central Pacific locomotive and looked east toward the Union Pacific train, taking the first photograph of Promontory. As detailed below, the date of the stereo card is wrong; it should be May 7. As Central Pacific Railroad’s guest photographer, Hart arrived with the Leland Stanford special train May 7th. Onboard the train was a reporter for the San Francisco Chronicle, who sent a May 7th dispatch, in which he noted that "Photographers are busy to-day attempting to obtain photographs of the junction of the roads, the line of locomotives, the scenery, appearances of the squads of laborers, etc., but it is feared that in consequence of the sultriness of the weather very good sketches [sic.] will not be obtained." This suggests that Hart was busy photographing at Promontory May 7, but the weather interfered. His "First Greeting" stereo card image shows the overcast scene. "At about half-past four o’clock, the Locomotive No. 60, of the Union Pacific, with a box-car and train of flats came on the switch and stopped within two hundred feet of the end of the Central Pacific track. The Central Pacific locomotive "Jupiter," No. 60, and "Whirlwind," No. 62, came up to the end of the track." 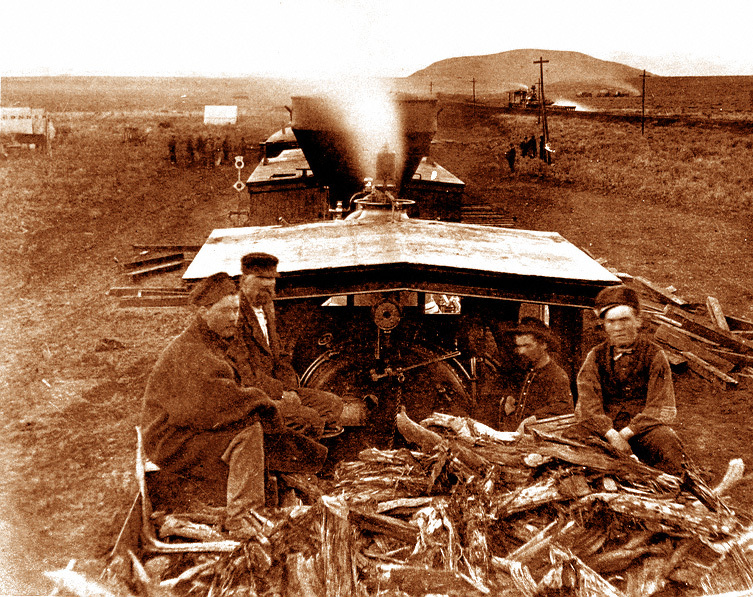 The UP train in Hart’s "First Greeting" image shows a Union Pacific locomotive pulling a box car and with a "train of flats" in front, as described by the Chronicle reporter. UP locomotives No. 60 through No. 67 were built by Schenectedy in 1868 and had diamond smoke stacks, like the one shown in Hart’s stereo card 354. "This afternoon the Union Pacific finished their track to a switch forty rods east of the end of the Central…At twenty minutes past four, Central time, and fifteen minutes past five, Cheyenne time, engine No. 66 [60?] (they have no names on the engines on the Union road) arrived from the East with Casement the contractor and others. No. 66 came to a halt, and the engineer let off steam in such a manner as to throw two circles like wreaths or crowns of white vapor into the air. Not a breath of wind stirred at the moment, and the aureole ascended three or four hundred feet skywards before disappearing, creating a beautiful effect, and calling forth involuntary cheers from the spectators. Engine No. 60 , named the "Whirlwind" on the Central road, standing opposite and within 160 feet, replied with a sharp whistle, and thus the first meeting of locomotives from the Atlantic and Pacific Coasts took place. Again, this shows that the "first greeting" occurred May 7 not May 9. Hart’s stereo view shows the engines and train as described by the Chronicle and Alta reporters. The spur track connecting all but the last rail was built May 9, suggesting that locomotives could get only as close as the then parallel tracks on May 7, as shown in Hart’s image. The weather on May 7 was raining and overcast, as described in period accounts. The weather cleared on Saturday May 8 and was not described on May 9, though a reporter for the Sacramento Bee took a hike to a nearby peak and noted the grand views, without comment of clouds or rain. Hart’s image reflects the weather of May 7 not May 9. Hart probably took the photograph late on the overcast afternoon of May 7, while Casement was soothing the CP crowd in Stanford’s special car, who were expecting the last spike celebration to occur on May 8. Casement invited them on a tour along the UP to Ogden the next day. Hart went with the Stanford party and took a number of photographs of Ogden and vicinity on Saturday, May 8. On May 9, reporters noted that the Stanford special went on a tour to the west of Promontory, as far west as Monument Point. Hart took several images of the party at the Salt Lake shore that day. The party returned late in the day. Dr. J. D. B. Stillman was with the Stanford party and chronicles their movements in a July 1869 article in the Overland Monthly. He nor do other reporters record Hart or any other photographer at Promontory until evening. Reporters noted crews building the connecting track; such activity would have attracted attention. Later photographs, by Russell, Savage, and Hart, show a number of tents, such as those by the CP last telegraph pole and in Casement’s camp that are absent in Hart’s stereo card 354. If it was taken on May 9, after returning from the tour of the lake, there would have been a flurry of tent building activity the night of May 9. This is doubtful. But, again, it appears that Hart did not take photographs at Promontory May 9. Why did Hart date his stereo card 354 as May 9th? In the series of stereo cards reprinted in Kibbey Mead’s Alfred A. Hart, Artist (Sacramento: California State Library Foundation, 1996), Hart arranged and numbered his stereo cards by geographic location, not chronology. Thus, the views of Ogden (numbers 361-4) taken May 8 appear after the last spike ceremony stereo cards of May 10 (numbers 355-60). The "First Greeting" stereo card, number 354, is before the last spike ceremony set, as it should be, except he dates it May 9, not May 7? Did he deliberately change the date for a tighter chronology? Did a type setter incorrectly think the 7 was a 9? Looking at the stereo card 354 image, comparing it to contemporary descriptions of the "first meeting of locomotives from the Atlantic and Pacific Coasts," knowing the weather during May 7-10, and knowing Hart’s travels over Friday-Monday, May 7-10, the stereo card he labels "The First Greeting of the Iron Horse, Promontory Point, May 9th, 1869," should be dated May 7. This helps us understand the chronology of events preceding the May 10 celebration and the look of the landscape a few days before the last spike ceremony. New book, "Niles Canyon Railways"